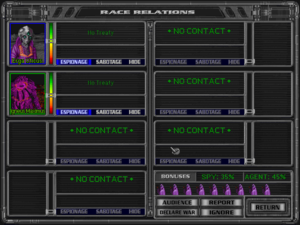 Manage your Race Relations from the Races Menu. It provides information about your opponents from the time when you first make contact (and they get similar information about your empire). Espionage and sabotage are often powerful weapons, especially in the early game when warships are slow and weak. These factors make "diplomacy" important even for Repulsive empires, whose options in negotiations are limited to declaring war, peace, and surrendering. This page summarizes the other options available to non-Repulsive empires - some AI non-Repulsive empires occasionally use a lot of diplomatic moves in an attempt to win via Galactic Council elections. Contact is made between 2 empires when either of them is in a position to send ships without Extended Fuel Tanks into systems occupied by the other. This arises when either empire occupies a new system in the right place (by creating a colony or an Outpost) or when either empire discovers improved fuel cells which extend its ships' range. Contact can be lost if someone (either empire or a third party) destroys or conquers the last colony or Outpost in a system and no other systems occupied by either empire are within either empire's ships' range. Contact can later be re-established in the ways described above. All can by initiated by your empire or another one. All are usually forbidden in online games between human players, to prevent collusion. AI empires become impatient and will refuse to talk for a while if you pester them with too many conversations in a short time or if one conversation goes on for too long - especially if the conversations are unfriendly or lead to nothing. One side seeks to gain a specific tech and offers various techs in exchange. If offering a tech trade to a human player, a list of all techs they have will appear, and you select the one you wish to trade. The other player then selects one they are willing to trade for the one you selected, or simply refuses to trade for that technology. If the person who was offered a trade selected an exchange technology, the first player may accept or reject the final exchange. For computers, they will always offer trades that are more beneficial to themselves; that is, the only techs which you may select to trade for will be at least one level below a technology that a computer would be willing to trade for. Once the computer selects the tech they want from you in exchange for the one you selected, you can either accept or reject the final exchange. Similarly, a computer may ask for a technology in exchange for one of yours, and if you select one you want, the trade will be completed. Again only the ones that the computer is willing to trade will appear. Eventually increases both sides' money income, although initially there's a decrease. It takes about 5 turns to break even, except that Fantastic Traders get into profit in 1 or 2 turns. The amount is adjusted based upon the size of the two empires. The larger the empires, the larger the eventual surpluses (and initial losses) will be. Note: Democracies gain 50% more on their trade treaties than do other government types. Eventually increases both sides' RPs, although initially there's a decrease in BCs. This means that initially the treaty will cost you money, but eventually will gain you research points. It does not give any technologies to the other empire. It usually takes about 5 turns to break even, and Fantastic Traders have no advantage in Research Treaties. Note: Democracies gain 50% more on their research treaties than do other government types, whereas Feudal governments generate 50% less. Ends a war, for a while at least. Both sides undertake not to attack each other for a specifed number of turns; breaking this promise damages your reputation with all AI players. If you propose a Peace Treaty, an AI player may ask for a "sweetener", e.g. money or a tech; human players do not get the opportunity for this type of extortion. While a Peace Treaty is in force either side may send warships to the other's systems without automatically starting a battle or blockade. Both sides undertake not to attack each other, with no time period specified. If the treaty lasts long enough diplomatic relations between the empires improve, which makes further negotiations more likely to succeed. But if either side sends warships to the other's systems war is likely. Each side's ships' range is extended as if the other's colonies and Outposts were its own. And either side may send warships to the other's systems without automatically starting a battle or blockade. Your allies expect you to help them in wars. Failure to do so causes diplomatic relations between the empires to deteriorate, and eventually to cancellation of the Alliance. If you're allied with 2 empires and they go to war with each other, you may be able to persude them to make peace (see below). One side asks for something for nothing. If the relationship is really friendly, this might not harm the relationship, although the side making the concession will probably expect a favor in return later. The system must be one that is occupied by the player making the demand. Including all colonies, with their populations and buildings. That's 5% of the other empire's gross income, not their surplus. Since this would usually be crippling, the answer is usually "No"; war is a common result. "... or your empire will be taken away." Yes, that's what they say. Apparently human players can't make this demand to AI players. These last 2 demonstrate total subservience. This page was last edited on 18 December 2014, at 18:19. This page has been accessed 20,258 times.